MAJOR DISCOVERY! MAPS OF DEADLY STORMS OF PAST YEARS CONFORMS GREATLY WITH THE U.N. MAP OF RESERVE AND CORRIDOR SYSTEM TO PROTECT BIODIVERSITY! Title: MAJOR DISCOVERY! MAPS OF DEADLY STORMS OF PAST YEARS CONFORMS GREATLY WITH THE U.N. MAP OF "RESERVE AND CORRIDOR SYSTEM TO PROTECT BIODIVERSITY"! Subtitle: When you see that the pattern of past deadly storms is consistent with the U.N. Map referenced above, your eyes should be opened to the fact that our weather may be controlled and utilized to create the social engineering so desired by the Illuminati. "(CNN) -- The complex web of life on Earth, what scientists call 'biodiversity, is in serious trouble. Biodiversity includes all living things that we depend on for our economies and our lives,' explained Brooks Yeager, vice president of global programs at the World Wildlife Fund in Washington, D.C. 'It's the forests, the oceans, the coral reefs, the marine fish, the algae, the insects that make up the living world around us and which we couldn't do without,' he said. This article sums up nicely the core propaganda campaign aimed at achieving the societal control and population reduction so ardently sought by the Illuminati specifically, and occult groups generally. For several decades now, radical environmental groups have been arguing that Mother Earth is in real trouble because of overpopulation and "human activity" that has been forced upon her by the Industrial Civilization. This repeated lie, over these many decades, and repeated by "scientists" from groups that have been created specifically to achieve this agenda -- Greenpeace, Sierra Club, Scientists For Responsible Growth, Friends of the Earth -- has resulted in many people of this world believing the lie. In fact, these radical scientists have now been joined by presidents, prime ministers, and even princes of the world, to the point where a Sustainable Earth conference was held in 1992 in Rio De Janerio in which President Bush, Sr., signed the protocol that later produced the Kyoto Accords. If and when these accords are ever fully implemented, they will slowly force Industrial Nations into bankruptcy. "... the whole environmental movement for the past two centuries can be traced back to Britain, beginning with the British Fauna and Flora Protection Society. From this society came the International Union for the Conservation of Nature (IUCN), which has now be renamed the World Conservation Union (still called IUCN). The World Conservation Union (IUCN) is the most influential of all environmental organizations. In 1961, the IUCN created the World Wildlife Fund (WWF) and designated Prince Phillip as its head ... The WWF manages many environmental and other projects on behalf of the United Nations. These three organizations -- the IUCN, the WWF, and the WRI -- provide the impetus for the world environmental movement. When the final satanic plan to force humans to live only in certain areas is realized, Prince Charles will have been that "Unseen Hand" that has produced and propelled the entire effort. Listen to some of Cohen's details regarding Prince Charles' leadership of this radical environmental agenda. In Part 1 and Part 2 of this Sustainable Development series, we have talked much about "silent weapons" in a "quiet war" that the Illuminati launched against the peoples of the world generally, and against Industrial Civilization specifically. These "silent weapons" includes Weather Control. Using extreme weather conditions to force the notion upon citizens that our very way of life is causing irreparable damage to a "fragile earth" sets the stage for the exact "benevolent slavery and genocide" of the Illuminati. Remember, the Book of Revelation portrays judgments upon the world that dramatically use weather weapons against the people! But, that is the stuff of which Part 5 is comprised. Further, all of God's judgments result in a two-thirds reduction of the population of the world, exactly the percent of reduction sought by the Illuminati! God has foretold that He will allow Satan and his forces to wield the power necessary to fulfill all of God's prophecies. We focus on Revelation 13:4-7, demonstrating the truth that God has apparently stepped aside to allow Satan to reveal enough scientific knowledge to the men who are in his service that God's judgments upon a wicked earth will be carried out at the hands of a small, select cadre of men who are totally sold out in Satan's service through their active participation in Black Magick Secret Societies. We also demonstrate in Seminar 2, "America Controls The True Flow of History", that Satan has always used his secret societies as the avenue through which he pours key scientific knowledge into the minds of key individuals. If you have never thought of this possibility, remember that, overnight, God imparted to selected Jewish families tremendous skill as to how to work in metals, gold, silver, wood, and other skilled disciplines so Moses could build the original Temple in exactly the way God wanted it built! Using demonic Guiding Spirits, Satan has done the same thing, imparting key scientific knowledge to certain individuals. When you hear the litany of inventors that were members of satanic secret societies, you will be both astounded and enlightened. When we share with you the final goal of this satanic plan to radically tear down our Industrial Civilization and reduce the population of the world by 66%, just remember these words. Explosive words do translate into explosive action, especially when uttered by a man given over to the Dark Forces, as the world learned to its sorrow in dealing with Adolf Hitler. In numerous articles concerning the Middle East, we have noted that world events are being propelled along an axis of Great Britain - U.S. - Israel, as these current leaders pursue a plan that has apparently come out of the House of Windsor, i.e., Prince Charles and Queen Elizabeth II. Now, we discover that Prince Charles is THE guiding force propelling the rabid environmentalism called "Sustainable Development"! Do not be deceived: American leaders have long been working for the British Monarchy in terms of total global policy that will bring Antichrist into power. Al Gore and the Clintons are mentioned above in this regard, but President Bush is also tightly controlled. You can ignore the public posturing that Bush is opposed to the Earth Sustainable Summit in Johannesburg, as he is very much in support of its policies. However, Bush knows the American people are not ready yet to give up their national sovereignty in all matters, including Extreme Environmentalism. Bush is also very well aware of the role the American economy is to play as the Economic Engine of the World right up to the point of World War III designed to produce Antichrist. Therefore, Bush is posturing; he is playing the visible role of opponent of Sustainability while he more discretely works to implement the global plan. Thus, even while he refuses to attend the Sustainable Earth Summit, he sends Secretary of State Colin Powell. Watch this coming Sustainable World Summit very carefully, over a period of time; you will discover Bush taking the same approach of deny first, caving in secondly. Before we get to the key section of this article, let us revisit our feature article, quoted at the beginning, written by CNN.com. This language speaking of the devastating impact that "human activity" is supposedly having on Mother Earth ties in directly to the rhetoric that will be coming out of the World Summit On Sustainability in Johannesburg this week, and is the same rhetoric to which the Bush Administration consented in its report to the United Nations. President Bush has put his Administration on record, agreeing that "human activity" is responsible for the earth's ills. When Bush allowed this radical report to be issued, Rush Limbaugh uncharacteristically exploded, calling the President, "George W. Al Gore". Thus, Bush has already lined American policy up parallel to the Sustainability Summit! [Read NEWS1663 for full details]. 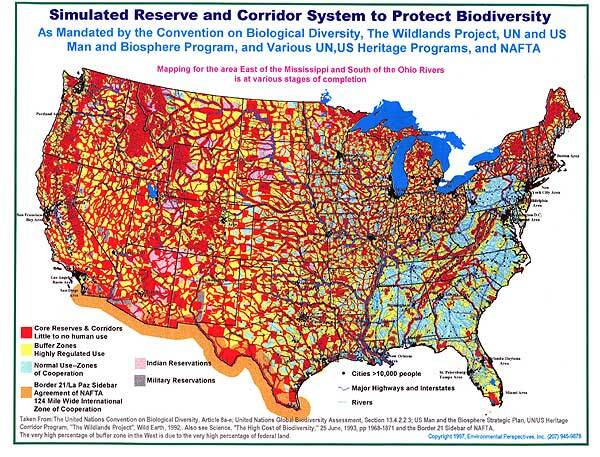 Now that the Bush Administration is on record as agreeing that "human activity" is responsible for all the supposed ills of the world, the stage is fully set for a more rapid pace to achieve the Biodiversity Plan, the map for which is printed below. We believe the final implementation of this plan as illustrated through this map will have to await until the planned 66% reduction in population has been carried out. Keep this in mind as you study the facts now presented. How does our government -- indeed, any government of any Industrialized nation -- plan to achieve such a terribly restrictive and devastating population reduction and redistribution? They obviously could achieve this goal in one of several ways. First, they could dictatorially seize control of the entire country, throw their more vigorous opponents into the concentration camps of the "hellish vision" of Ashcroft [NEWS1691]. This plan carries great risk, for several tens of millions of Americans still own fire arms, and could make it very difficult to carry out their vision in this extreme manner. Or, they could so arrange events -- either singly or in combination -- that would cause Americans to panic, demanding the government take any action(s) necessary to stabilize the crisis upon them. The Illuminati plans to so create multiple crises so that the American people will beg them to enslave us! Thus, "wars and rumors of wars" are planned, beginning first with the Middle East, then Korea, then China and Taiwan. An active terror war will be foisted upon us, as Arab terrorist strike our cities with powerful weapons. But, Jesus mentioned factors other than "wars and rumors of wars" in his Matthew 24 dissertation , did he not? Jesus told us that "famines" and "earthquakes in many places" will also be occurring along with "wars and rumors of wars" as part of the birthpangs producing Antichrist. Therefore, it is highly significant that the Illuminati has produced a detailed plan to produce their Masonic Christ, and that this plan envisions the type of weather events of which Jesus spoke! If the Illuminati wanted to produce a scenario in which Americans would be forced off their lands and thrown out of their cities, what better weapon to use than control of weather? What better weapon can you ask for than flooding, hurricanes, tornados, drought, powerful winds, and unprecedented wildfires that render the ground nearly useless? Their aim would be to set the stage for a credible case to be made later, during a time of great crisis led by a popular leader, that the reason we have suffered so many natural catastrophes is because "human activity" caused by our Industrial Civilization has so overloaded Mother Earth that she cannot sustain us anymore. Thus, the president or whomever is in charge at the time of this great multiple crisis, can order people off their lands and out of their cities with strong expectation they will meekly submit. Keep this thought in mind as we proceed through the rest of this article. We hope to demonstrate to you that the extreme storms of the past and present have occurred in the very areas of this Biodiverstiy Map, above. We will study the geographical location of the many storms by studying the storms specifically. 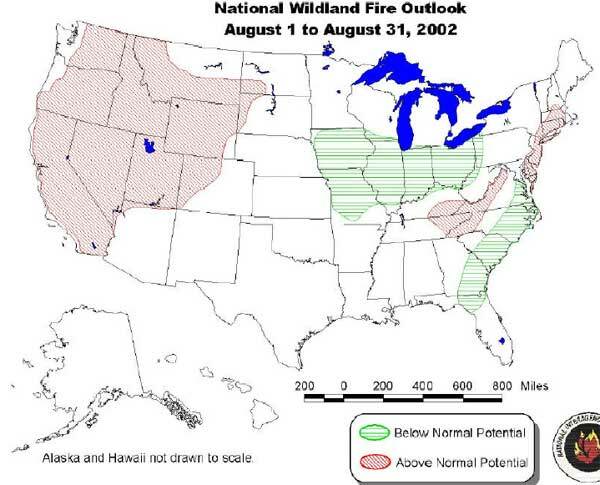 As you study this map depicting the outlook for National Wildfires for the month of August, 2002 alone, you can see that the areas of potential burning lie within the areas designated by the Biodiversity Map, above. What is significant about the fires of 2002 is that they are so tremendously hot, getting up to 2,000 degrees Fahrenheit, an intense heat that will turn much of the forest land into glass, rendering it useless for farming and a good many other types of "human activity" relating to our Industrial Civilization. The states of Oregon, Washington, California, Utah, Idaho, Montana, Wyoming, Western Colorado, and Nevada were extremely dry, providing "Above Normal Potential" for wildland fires. Of great importance to us is the wildfires of 2002, which have been much hotter than fires of past years, as noted above. However, the Appalachian Area is extremely dry, as are the states from Washington, D.C. up to Massachusetts. If you look at the Biodiversity Map, above, you will note that these areas are specifically detailed as areas in which human activity will be severely detailed! Thus, while the acres burned by human activity is slightly less than those caused by lightening, the number of fires caused by humans is eight times as many as those caused by lightening! Fighting all these fires caused by human activity is expensive, as we can see from the chart at this URL, immediately following the chart listing the above statistics. We see that the total dollar cost for fighting fires is $1,362,367,000 -- that is 1.362 Billion Dollars! We could save ourselves an awful lot of money if we did not have to fight 102,694 human-caused fires. However, it is worthy of note that all the serious fires that have generated so much publicity this past year were started on government land, not on private land, with some of these fires being started by government employees. As we stated in Part 2, severe drought is more devastating to a way of life than even floods. A long, prolonged drought can drive farmers out of land that their families might have held for generations, farms that might even be completely paid off. If a government wanted a long-term lifestyle killer, drought fits the bill perfectly. Drought is also a prerequisite for wildland forest fires. Once the kindling on the surface of the forest becomes dead and dry, a severe drought dries living trees, brush, and plants so that, when a fire begins, it is guaranteed to burn hot and furiously. 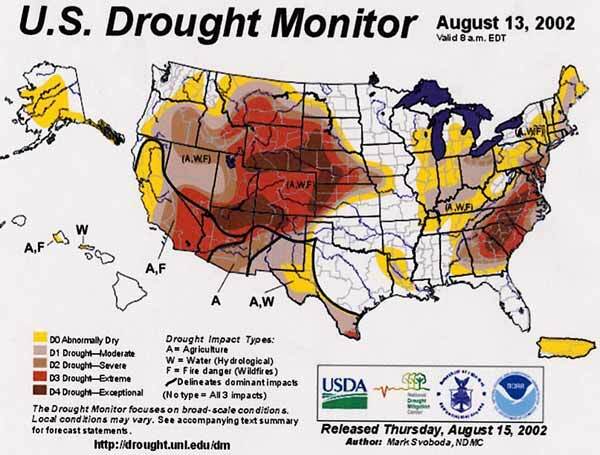 Please study this Drought Map, above dated August 13, 2002. Just a cursory glance demonstrates that the areas most severely affected by severe and sustained drought -- Dark Brown and Red -- were the areas most coveted by the Biodiversity Reserve and Corridor Map. These areas are the Far West and Mid-West states, plus the Northwest-Northeast corridor from Georgia through the Carolinas, Virginia, up through Washington, D.C. This area abuts up to, or includes part of, the string of Core Reserves and Buffer Zones depicted running Northwest-Northeast from Alabama through Georgia up to Pennsylvania. The Northeast is either "Abnormally Dry" or in "Moderate" Drought. The Core Reserve System Map shows that the entire Northeast is slated to be virtually swept of human activity. The Central States of Ohio, Indiana, Illinois, and Michigan are all in "Abnormally Dry" or in "Moderate" Drought. But, by far, the most devastating drought is located in the Midwest to Far West. This area is long coveted by extreme environmentalists, who want to drive our farmers out of business, out of the land, and out of the towns and cities so that the "Rewilding" process can begin in earnest. Some areas of Nebraska, for example, now have only about 90 days of water supply left, for any purpose whatsoever, including drinking. Farmers all throughout this area are struggling with drought conditions not seen since the 1930's, a time in which rural America struggled not only with Depression, but also with Drought. The only areas not showing on this Drought Monitor Map in drought is the Center part of the country along the Mississippi and Missouri River systems. However, this region figures prominently in the next area under investigation: Flooding. From 1927 to 1993, and in 1995, 1997, and 1998, the entire Midwest area along the Mississippi and Missouri Rivers experienced tremendous losses because of flooding. In Part 2 of this series, we demonstrated how a flooding so rare as to only occur naturally every 500 years could be caused by the combination of GWEN and HAARP towers. The 20th Century has seen unprecedented flooding, especially in this specific geographical area. Since the Biodiversity map is thoroughly pocketed with areas of Core Reserves [no human activity] and Buffer Zones that are highly regulated, we should expect that a lot of Social Engineering would be planned for this area. As you can see, these areas in the Midwest and Central States have been getting hit repeatedly with massive flooding. 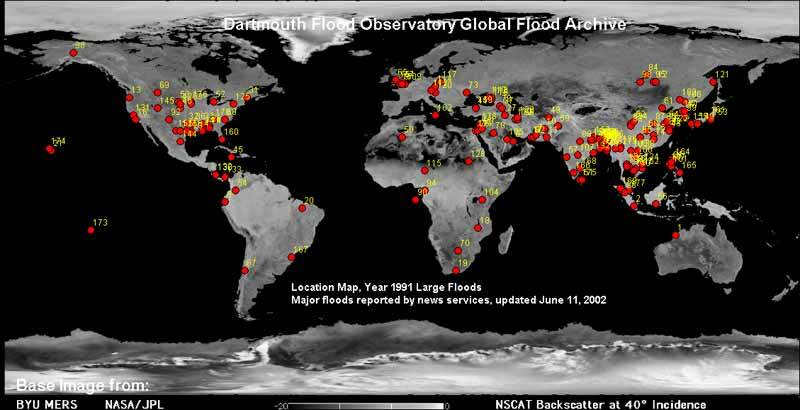 Consider the brief statistics of just two key floods: 1927, 1993. Of course, the 1993 flood was the one we detailed in Part 2, which lasted the Biblical time of 40 days and 40 nights. In Part 2, we demonstrated just how easy it would be to create such a flood using Tesla Technology, pulsating at just the same ELF frequency at which the earth naturally pulsates, and using the combination of GWEN and HAARP towers. Flooding is one of those curses of Nature which drive people out of their homes and cities temporarily, but usually not permanently. Human nature is so obstinate that people will rebuild time and time again after their homes and towns are devastated. This part of human nature we shall discuss in Part 4. As we examine the map of the Significant Floods of the 20th Century, we see that this key area of the Mississippi and Missouri River Basins have repeatedly experienced great flooding, devastating flooding. This flooding is unique to the 20th Century, the very century in which Tesla's technology has been been available to the Illuminati. We further see that this flooding map shows hurricanes hitting the coastline from the Texas - Florida East-West axis to the North-South axis from Florida nearly to New England. 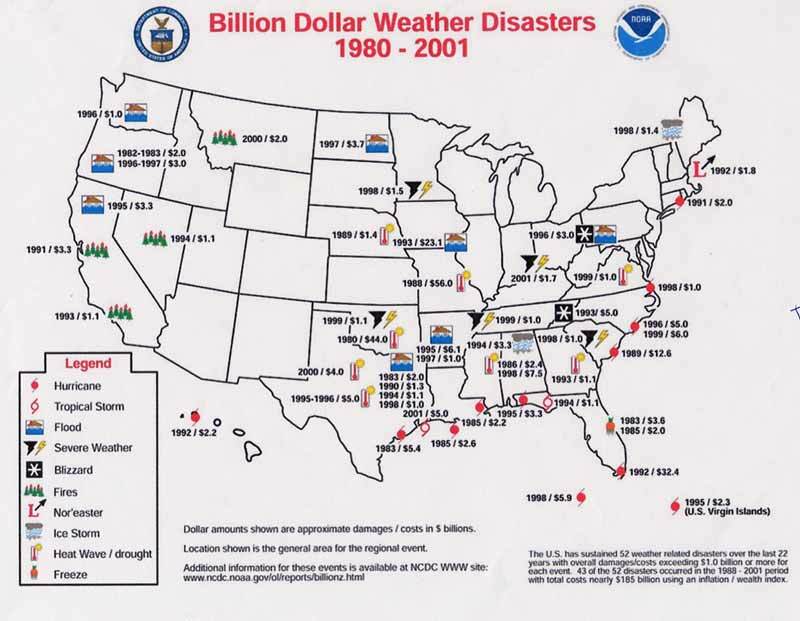 With this in mind, let us examine another map that shows hurricanes more succinctly, the "Billion Dollar Weather Disasters Map, 1980-2001". As we demonstrated in Part 2, control of hurricanes has been possible for some time now. We read portions of a Wall Street Journal story printed November 13, 1997, in which Malaysia hired a Russian weather modification company to create a typhoon [hurricane] and steer it closely enough to the Malaysian cities so that the winds would blow the haze away, but not so closely to shore that damage would occur. The Russian company then steered the typhoon away out to the open sea, where they dissipated it. For the technology of creating, steering, and dissipating hurricanes to be so advanced in 1997 as to be this routine and routinely available, we know that the beginning of this technology had to occur 20-30 years ago. Thus, it is with great interest to note the location of where "Billion Dollar" hurricanes have hit this nation from 1980-2001. When you compare the dots of hurricane impact on this "Billion Dollar" disaster map to the planned Biodiversity Map, you will shockingly discover that each of these dots makes land at precisely the area designated as a Red Core Reserve [no human activity] or a Yellow Buffer Zone [human activity highly regulated]. Thus, you have to ask a very important question, do you not? 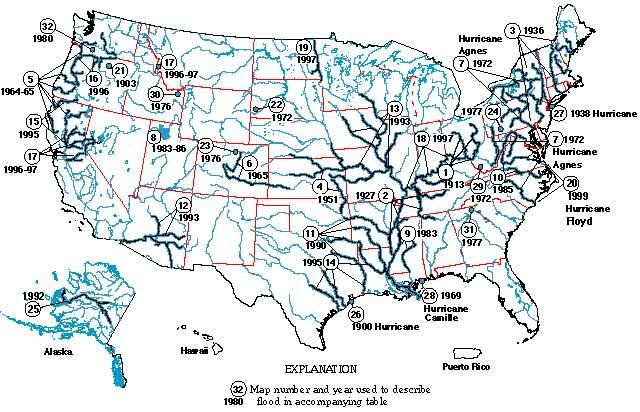 Given our ability to create, steer, control, and dissipate hurricanes, why have we had any of these storms since 1980? Every time a natural hurricane spawns, we could steer it to the open sea and dissipate it so that it caused no damage whatsoever to human settlements or to "human activity". Therefore, when you understand that the entire emphasis of this upcoming World Summit on Sustainable Development is focussed on the "unsustainable" nature of our Industrial Civilization, you will realize that tremendous effort has already been expended to lay the groundwork for someone to someday declare that Mother Gaia simply cannot continue to tolerate and support our current civilization. 1. Hurricanes and Tropical Storms [Tropical Storms bring huge amounts of rain, causing significant flooding]. A "Nor'easter" is depicted hitting New England in 1992. A "Nor'easter" is a hurricane that brings with it significant flooding and strong winds. 3. Severe Weather -- the symbols here are a black funnel cloud of a tornado and a lightening bolt. It is more than interesting to note that the number of tornadoes since 1916 has increased dramatically -- off the charts, actually! In 1916, about 50 tornadoes were noted, climbing to almost 1,400 in 1996 [http://k12.ocs.ou.edu/teachers/graphics/TorFatalChart.gif, Tornado Fatal Chart]. This increase is a 28 fold increase! Since no one could possibly argue that this increase is "natural", one can only argue that is it "unnatural", i.e., by human agency. Of course, the World Earth Summit people will argue that this increase is simply Mother Gaia's response to the "human activity" pursuant to our unsustainable Industrial Civlization. We see these storms devastating the following sections of the country, each of which is listed on the Biodiversity map as being an area set aside as a Red Core Reserve or a Yellow Buffer Zone. The Midwest -- Four (4) floods are depicted, plus three (3) tornado/lightning storms, six (6) Heat Wave/Drought conditions, three (3) hurricanes, and one (1) tropical storm. From North Dakota at the north to Texas at the south, and over to the Mississippi River, this entire region has been hit hard by "Billion Dollar Weather Disasters". This entire section of the country is heavily laced with Red Core Reserves and Yellow Buffer Zones. The Central States -- Two (2) hurricanes and one (1) tropical storm is depicted as causing a billion dollars worth of damage. One (1) instance of Heat Wave/Drought is shown, as is one (1) tornado/lightning storm, one (1) ice storm are depicted. This area is also shown being extensively set aside as Red Core Reserves and Yellow Buffer Zones. The Northeast - Northwest Corridor bounded by Mississippi on the Northeast and running up to the West Virginia-Pennsylvania border toward the Northeast is shown with a real mix of Red Core Reserves, Yellow Buffer Zones, and Blue Normal Use Zones. In fact, this is the region of the country in which the most human activity will be allowed. This area had seven (7) hurricanes, one (1) Nor'easter, two (2) Heat Wave/Droughts, two (2) blizzards, one (1) flood, and one (1) freeze of the Florida Orange crop -- each causing at least One Billion Dollars of damage. 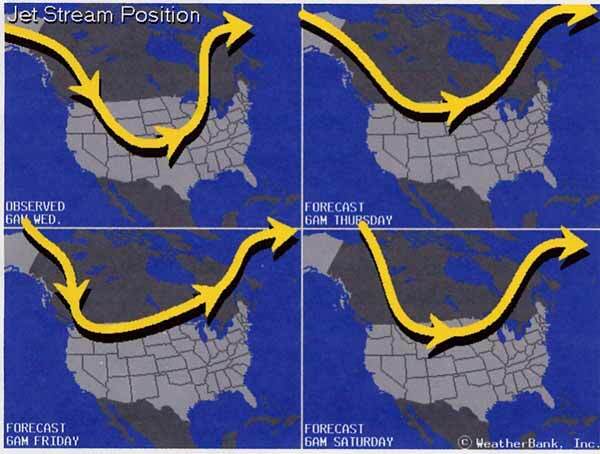 BRINGING THE JET STREAM "DOWN TO THE DECK"
As we warned in Part 2, one of the capabilities of HARRP Tesla Technology is that it controls, steers, and diverts the Jet Stream. Once this capability is achieved, scientists truly are in control of our weather, because the Jet Stream steers storms. However, our research turned up one most interesting fact: scientists can bring the Jet Stream "down to the deck", i.e., down to the ground! Now, since your major goal is to persuade human beings to leave their land and their cities because nature had suddenly turned against them, what more perfect weapon to use than the Jet Stream on the ground? 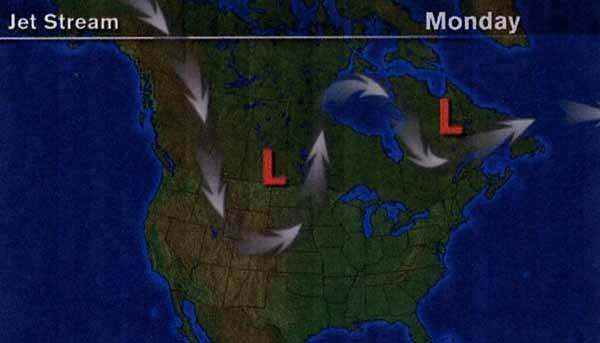 For information about the Jet Stream, go to http://www.usatoday.com/weather/wpjet.htm, USA Today. A Jet Stream has "a specific meaning of upper atmospheric winds blowing faster than 57 mph" [http://www.usatoday.com/weather/wwind0.htm]. However, they may reach velocity of well over 100 miles per hour! Sometimes, Jet Streams can reach 150 miles per hour! [http://squall.sfsu.edu/crws/map_info/jetstream_info.html]. Obviously, were the Jet Stream to blow consistently on the ground in speeds of 100 - 150 miles per hour, human life would be totally impossible, and people would begin to leave in droves! Therefore, we have begun to watch for instances in which such incredibly strong winds suddenly spring up. On August 12, 2002, the residents of Nickerson, Kansas, were awakened to winds blowing over 100 mph! Let us examine the news story. NEWS BRIEF: "Thousands lose power as 100 mph winds lash Kansas", by Stan Finger, The Wichita Eagle, miami.com, Posted on Wed., August 14, 2002. Nickerson, Kan -- "Debbie Adams stepped outside after the storm and discovered that she lived on an island. Floodwaters covered cars to their windows, and tree limbs snapped by 100 mph winds blocked street after street ... While the floodwaters receded Tuesday morning, so many power lines and utility poles were knocked down that all of Nickerson was without power -- and it could be days before everyone can turn their lights back on." "... A supercell thunderstorm that morphed into a line known as a bow echo slammed Nickerson and South Hutchinson with straight-line winds of up to 100 mph and as much as 4 inches of rain ... Winds of up to 60 mph were recorded in Sedgwick County ... In South Hutchinson, the storm blew more than two dozen railcars off their tracks and downed tree limbs and power lines." Winds this powerful and spread over an area like this described, above, could definitely be a Jet Stream that had been wrenched down on the surface of the ground to deliver this kind of knockout punch using 60 to 100 mile per hour winds. The only question is what the weather maps would show for that date and possibly one or two days following as to the exact position of the Jet Stream on Monday evening, August 12, when the storm hit. As you can see from this Jet Stream image from The Weather Channel, the Jet Stream was depicted as blowing over Colorado and partly over Kansas, pulling up just before it covers very much of the state; Nickerson is located just a little over half-way across the state from the Colorado state line.However, this Weather Channel map may not be an accurate representation of the precise location of the Jet Stream on 12 August. As you can see from this picture, the Jet Stream was still running directly across the entire state of Kansas at 6am, Wednesday, August 14. By 6am Thursday, it had shifted to the U.S. - Canadian border. The Jet Stream was apparently running directly through Kansas on the date of the storm, August 12, 2002, late at night. If the Illuminati has the capability of bringing the Jet Stream "down on the deck", every place on earth is at risk. Very quickly, life would become unbearable and the people would crack under the strain and begin to leave, quickly and in droves. Of course, the government would be intoning on that "human activity" has brought poor Mother Gaia to this point, where she has to start "cleansing" herself of her unwanted human cargo by delivering these terrible storms. If the Illuminati did not intervene, all of the earth will die! Therefore, they believe they are acting "humanely" by removing the planned 4 billion people from the earth, for they are saving the earth, they are saving two billion people, and they are saving the descendants to come. Aren't we glad the Illuminati is so wise, so caring, and so "benevolent"? Let us allow the final statistics on the effectiveness of weather disasters on human habitation to come from a government source at http://www.ngdc.noaa.gov/paleo/ctl/10.html. Listen to the government explanation of events from 1990 - 2000, accompanied by an explanation as to how each weather disaster impacted "human activities". 3. Record-setting low temperatures for an extended period of time during a critical growing period in California's central valley causing estimated $3.4 billion damage." 2. October- Typhoon Thelma, hits Philippines and 6000 people die. 4. November- 'Halloween Nor'Easter' later called the 'Perfect Storm' develops off Nova Scotia. [This was the "Perfect Storm" from which the movie by that name was developed." 2. Sept. - Hurricane Iniki affects three Hawaiian Islands and results in over $1 billion in damage." 1. "March- 'Storm of the Century' hits US east coast with 270 missing, including 14 in Florida who die in tornadoes. "March- Severe ice storm in southeast US causes an estimated $3 billion in damages." 1. "Atlantic Hurricane Season second busiest hurricane season since 1871. 19 named storms, 11 of which reached hurricane strength causing $8 billion in damage." Imagine that! Eleven (11) storms reached hurricane strength that year, causing all that damage. 2. July - Heat wave hits central US, causing 830 deaths, 525 of them in Chicago. 3. December- Intense storm with heavy rains strikes Pacific Northwest, causing 6 deaths." "Hurricanes Bertha and Fran hit the North Carolina resulting in major flooding. Total damages in the United States over $3.5 billion." 1. "Impact of 1997-1998 ENSO warm event estimated at $25 to $33 billion. 2. Flooding in California and Dakotas cost $6.7 billion. This was a major flooding event, located in California and the Red River Valley of North Dakota, Minnesota, and Manitoba." 1. "January- Severe Ice Storm hits NE US and Canada, leaving millions without electricity, triggering flooding. 2. November- Hurricane Mitch devastates Central America, killing estimated 11,000, the greatest loss of life in the western hemisphere from a tropical system since 1780. This is nearly an unprecedented storm for Central America, the strongest storm since 1780, a 218 year span. " 1. "La Niña linked to droughts conditions in much of US and higher than normal precipitation in Pacific Northwest. 2. December- Severe windstorms uproot trees in France in December. 1. "Wildfires in the Western US burn over 6 million acres and cost over $1 billion to fight. 2. 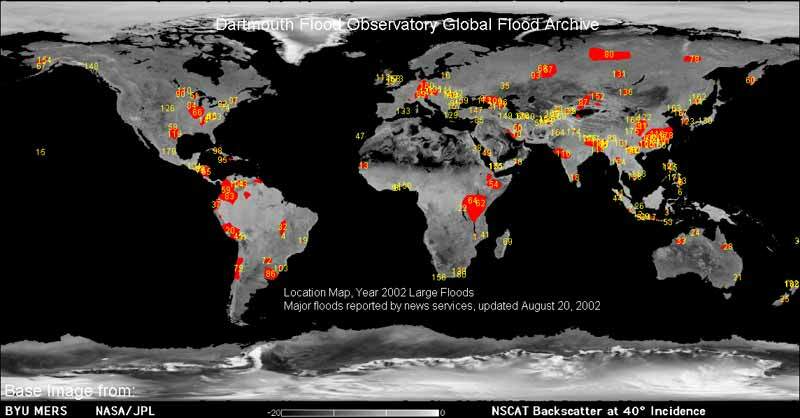 Severe drought effects parts of US and Asia, while flooding occurs in SW Asia." We are well aware of the extreme weather conditions this year -- 2002 -- which have devastated unprecedented numbers of acres, causing unbelievable damage, and rendering the land uninhabitable in many cases. All through the 20th Century, scientists controlling our weather have sent storm after storm after storm against the very areas of our country designated as Red Core Reserves and Yellow Highly Regulated Buffer Zones. Human nature is such that the men and women devastated by these storms have fought back -- many times with government sponsored insurance -- to rebuild homes, transportation networks, and cities. What did New Age author, Bill Cooper say? People by nature are resilient. They "learn to tolerate its encroachment on their lives" and just go about rebuilding and living their lives. New World Order planners know all about human nature; therefore, they knew that these storms, as devastating as they were, would not force people off their lands and out of their cities. Key in on the words, "until the pressure (psychological via economic) becomes too great and they crack up". We contend that nearly 100 years of deliberately creating storms using Tesla's Technology is simply building until the "pressure becomes too great and they crack up". This scenario is likely to come in the form of a gigantic global -- or nearly global -- "Perfect Storm", also referred to in New Age circles as "The Coming Global Superstorm". We shall address this issue in Part 4. As God has allowed wicked man to gain unprecedented scientific knowledge over a variety of scientific disciplines -- the chief of which is Tesla Technology -- man has the capability within his hands to deliver the kinds of judgments upon the earth as foretold in the Book of Revelation.